Hemp growers and supporters rally at the State House in Augusta on Tuesday. Dozens of people involved with the state’s burgeoning hemp industry filled the State House Tuesday to protest a state order directing retailers to remove edible products containing cannabidiol, or CBD, from their shelves. The order follows an announcement in December by the federal Food and Drug Administration that CBD is not an approved food additive. The FDA’s ruling has prompted Maine and other states to halt retail sales of increasingly popular CBD-infused drinks and foods. But supporters of Maine’s hemp industry say edible CBD is a major part of their business and they hope a new emergency bill will allow the products to continue to be sold. When Congress overwhelmingly approved an $867 billion farm bill in December, it was billed as a major boon to the nation’s hemp industry. It was viewed as a win because the bill legalized the production of hemp, a form of cannabis with lower THC levels than marijuana. CBD, a derivative of hemp, was considered a big business opportunity for hemp producers and retailers because it allowed people to smoke, vape or ingest it and obtain the purported health benefits of cannabis without the mind-altering effects of marijuana. That’s why CBD began showing up everywhere — from gas stations to big-name retailers — as purveyors angled for their slice of a hemp market that analysts have pegged as a $22 billion industry by 2022. But a foggy legal landscape has Maine and other states wrestling with how to capitalize on the CBD market. 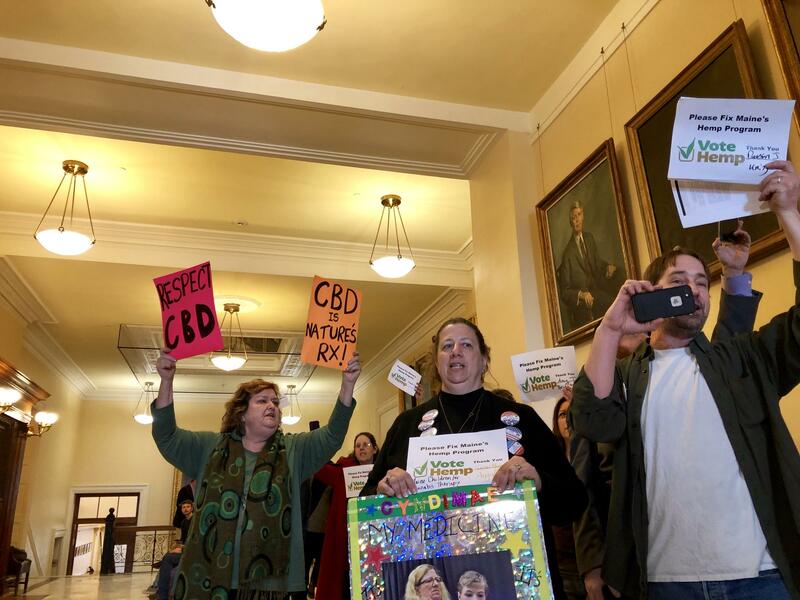 The dozens of people who showed up at the State House were protesting the state’s recent decision to tell retailers they can no longer sell edible CBD because the federal Food and Drug Administration has not approved it as a food additive. Smoked, vaped or lotion-based CBD is still allowed, as are edible sales to medical marijuana patients. But edible CBD is an exploding enterprise, popular in California juice and coffee bars, and increasingly a big part of Maine’s hemp industry. “This is as much as 40 percent of the market. So, you know, so it could be a drastic rule change here in the state of Maine,” says King Bishop, a hemp and marijuana farmer from Morrill. Bishop got into the hemp business after Maine passed a law three years ago that legalized cultivation. He says the state directive on edible CBD comes at a time when businesses, like his, are just getting off the ground. “I process hemp. So I’m one of the processors that works with farmers to turn the hemp into oil. And we’re just getting geared up here in the state of Maine with a good hemp program and this just throws a wrench in the works,” he says. Bishop says he isn’t convinced that the move to pull edible CBD is necessary or even legal. “It’s not even a law yet. So these are basically bureaucrats, unelected officials here in the state of Maine, making decisions that they don’t have the authority to do,” he says. In a press statement, a spokeswoman for Gov. Janet Mills says the state directive was an attempt to navigate the unclear regulatory landscape of CBD and that it was done after consulting with the Maine Office of the Attorney General, which represents the state in legal affairs. Maine isn’t the first state to take edible CBD off retailers’ shelves. California did it last summer and others have followed suit. Joe Saltalamacchia, a hemp farmer from Unity who participated in Tuesday’s demonstration, says the legal tension centers on how regulators should classify CBD. “I think there’s just a question, is it a food or is it a pharma? What is it? The answer to that right now is yes. Really, that’s what it is. There’s no definitive answer yet as to what it is. There’s not enough research yet,” he says. Saltalamacchia says people in the hemp industry understand that products like CBD need to be regulated and the purported health effects tested. But he says the fledgling industry needs clarification, and quickly. “We know we need a solution and we need it fast because we’re starting a half-million-dollar farm this year. We’re pulling dairy farms that were going under, we’re picking them back up and we’re going to grow hemp,” he says. A resolution at the federal level could take time. Meanwhile, the Mills administration says it’s moving quickly to do what it can to make sure the hemp industry can continue to grow. A Mills spokeswoman says the governor is working with Democratic state Rep. Craig Hickman on an emergency bill that would allow all CBD products to be marketed and sold in Maine, although not across state lines. “We are working to fix this problem as expeditiously and responsibly as possible,” Hickman says. He says a public hearing on his bill will take place later this month. Originally published 5:12 p.m. February 5, 2018.